A sympathy for unloved and forgotten relics and a fascination with nature's resilience have inspired him to create visions of a world where man's impact is being slowly reclaimed by nature. A sympathy for unloved and forgotten relics and a fascination with nature’s resilience have inspired him to create visions of a world where man’s impact is being slowly reclaimed by nature. 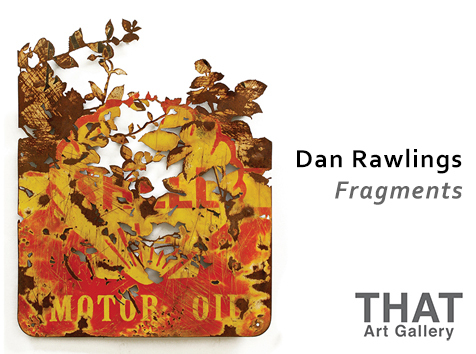 Dan considers no technique or substrate out of bounds in achieving his intended results but is probably best know for his manipulation of metal and light, conceived with intricate hand-plasma cutting. Recently he has been introducing sign painting and motion to his works. Notable projects include the sculpture ‘Nature Delivers’ based on the wreckage of a ford transit van and the huge ‘Mighty Oak’, based on a 16 ft farm yard silo constructed for the Affordable Art Fair’s 15th birthday in Battersea Park. His signature works cut from vintage hand saws can be found in collections around the world.